Chronic back and leg Pain symptoms can vary widely like; Delayed Pain, Spinal stenosis, Spondylolisthesis, Osteoarthritis… Your body keeps aching weeks, months, or even years after the injury. Managing pain properly at an early stage can help limit indications in both time and severity. Spinal cord stimulation is effective for a number of chronic pain conditions, such as neck pain, back pain, complex regional pain conditions etc. Every patient is unique and one patient’s experience cannot be translated for advising the other patient. However, if the patient has any weakness, sensory loss or bladder or bowel symptoms surgery is a rule rather than exception and he should be urgently seen by a neurosurgeon. 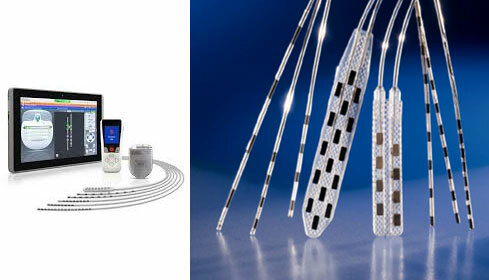 There are two main components of the system implanted in the patient’s body. a) First a thin wire called the lead is positioned in epidural space above spinal cord. Different physician and patient programmers and IPG. One of the most important attribute of using spinal cord stimulation is that it helps you to select the right patient after careful titration. At the Jaslok Hospital we perform stimulation trial by implanting percutaneous electrodes which are then connected to an extension device which in turn is connected to the programmer. During the postoperative period the patient is provided with several programs through a trial stimulator. These programs will cover the area of his pain by paraesthesia (tingling sensation). Once that is confirmed we then remove the extension device and connect the percutaneous lead to the permanent IPG or the pacemaker which is implanted either at the level of the navel or over the buttocks. The second part of the procedure is done under general anesthetic. patient with minimal side effect and the lowest possible voltage. This is a tedious task and achieved by lot of experience. Once the patient has been put on a stable programming parameter by the pain physician, we can then decide to discharge the patient. The patient is provided with 5 to 6 sets of different programming parameters which he can use with the help of the controller given to him even after discharge. We have several patients who have undergone spinal cord stimulation for pain of different origin, these includes, post cervical laminectomy pain, CRPS II, brachial plexus injury pain, back pain radiating to lower limb, etc. 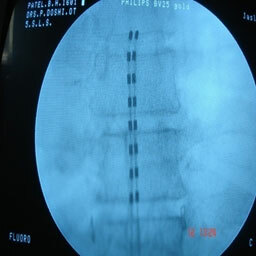 The results of spinal cord stimulation surgery vary between indications and between centers. At Jaslok hospital, the spinal cord stimulation procedure is performed jointly by the pain physician and the neurosurgeon and a dedicated post spinal cord stimulation surgical team assists in programming and rehabilitation of these patients.